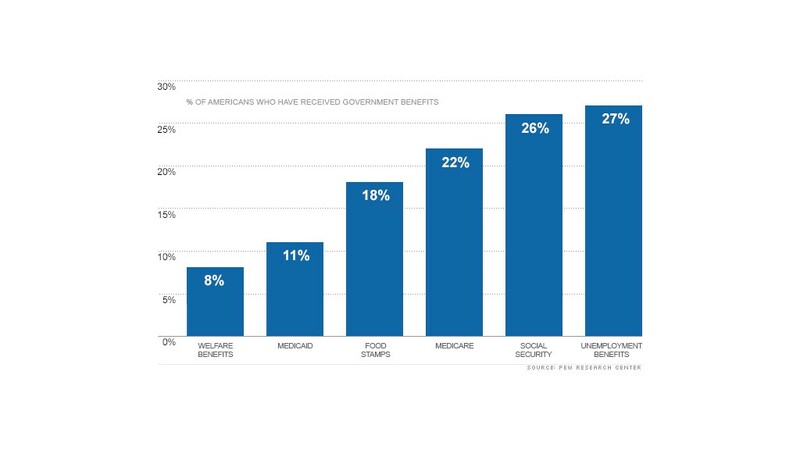 About 55% of Americans have received at least one of the following benefits: unemployment benefits, Social Security, Medicare, food stamps, Medicaid and welfare. *See correction at end of article. More than half of Americans have received benefits from government entitlement programs during their lifetimes, according to a Pew Research Center report released Tuesday. When factoring in veterans' benefits and federal college loans and grants as well, the number rises to 70% of Americans receiving government aid. *An earlier version of the chart incorrectly stated percentages for Medicaid, food stamps, Medicare, and Social Security. A corrected version appears above.